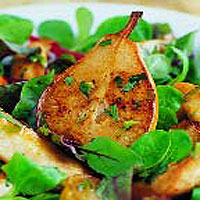 Hot pan-fried pears and chicken fillets are dressed with English perry - a cider-like drink made from pears - to make a main meal salad. Heat the oil in a heavy-based frying pan over a high heat. Fry the fillets for 6-8 minutes, turning once. Peel and core the pears and cut into wedges. Add the pear to the chicken and cook for a further 3-4 minutes, or until the pears are golden all over and the fillets are thoroughly cooked, there is no pink meat and the juices run clear. Meanwhile, place all the dressing ingredients in a jar with some seasoning, screw on the lid and shake to combine. Remove the pan from the heat, allow to cool slightly then add the dressing to the pan. Arrange the salad between 2 serving plates or on 1 large platter. Spoon the chicken and pears over, then drizzle with the warm dressing and serve immediately, with crusty bread. Before cutting the pears into wedges, cut a section from the middles for a pretty garnish.